Monday’s 252-page report from Ropes & Gray, the law firm contracted by the USOC to investigate the role of individuals and institutions in enabling Larry Nassar’s decades of sexual abuse of gymnasts, has so far led to widespread condemnation of the USOC and USA Gymnastics (again) and at least one firing—Alan Ashley, who learned about the allegations against Nassar in 2015, was terminated on Monday upon the publication of the report. Here’s some more of the horror. Nassar was in charge of medical care at USA Gymnastics events for nearly two decades and helped create most of the policies for the medical personnel. This included policies around sexual misconduct. Nassar was very concerned about false reporting. It takes a mind-boggling amount of chutzpah for a serial sexual abuser to attempt to enshrine any policy on false accusations. Indeed, he likely would’ve only been comfortable with a peer review that included his best friends and protectors, like the MSU 2014 Title IX investigation had. For a guy who repeatedly claimed that he had never had a single complaint, he sure seemed concerned about false accusations. The pot calls the kettle a predator. The report documents instances of Nassar complaining about the behavior of other members of the medical staff. Tucked away in a footnote is the fact that Nassar worked with athletes in other sports. In 2008, in addition to serving as the team physician for the U.S. women’s gymnastics team, Nassar was also the team doctor for USA Taekwondo. Peter Vidmar, a member of the 1984 gold medal–winning U.S. men’s team, was the board chair of USA Gymnastics from 2009 until December 2015. He stepped down before his term was over and moved to Australia to take over the Melbourne mission of the Church of Jesus Christ of Latter-day Saints. By the time he left the organization, he was aware of the allegations against Larry Nassar. Since the scandal broke, Vidmar has been MIA on the other side of the world, so it was a pleasant surprise to see him quoted in the report. He may not be speaking to journalists, but he at least talked to the investigators. Of course, Vidmar didn’t stick around long enough to make sure of that. After the Independent Investigators notified Mr. Blackmun, through counsel, of the lack of corroborating evidence for the internal review and asked for an explanation, Mr. Blackmun informed the Independent Investigators, through counsel, that he was mistaken in his recollection about having undertaken such an effort. The USOC did absolutely nothing when it was notified about Nassar. They didn’t make sure that USA Gymnastics had reported him to law enforcement. They didn’t check to see if Nassar still had access to athletes. They didn’t tell SafeSport about the allegations. Malia Arrington, then USOC’s Director of Ethics and SafeSport, did not learn of the sexual misconduct allegations, or more specifically that a USAG team doctor was alleged to have sexually abused one or more athletes, until the allegations were made public in the Indianapolis Star approximately one year later. In the early ‘80s, Doug Boger was prosecuted for physically assaulting his athletes, but was acquitted and continued coaching. 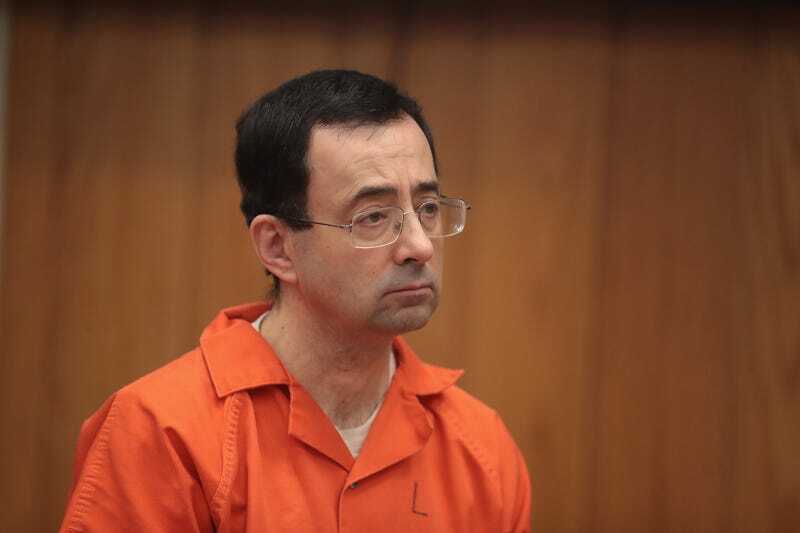 Years later, one of his victims wrote a letter to Steve Penny, detailing her experiences and urged USA Gymnastics to act to ban Boger, who was still an active coach. USA Gymnastics responded by telling the former gymnast that she needed to get more people to come forward. She returned with a letter signed by nine others, but was again told this was not enough. Then three more women signed and many sent individual letters to the national office. In all, USA Gymnastics had 21 pages worth of allegations against Boger. While the women were working to get Boger banned, USA Gymnastics named him “Coach of the Year” for the tumbling and trampoline program. Boger was eventually banned, but it took two years and several more women coming forward to make this outcome possible. And even this didn’t stop him from coaching. Though he was listed as permanently ineligible, he was working at a gym in Colorado that was sanctioned to participate in USA Gymnastics competitions. When notified about this, USA Gymnastics explained that it “has no authority over the club business” and could not act. It took a report about Boger in the Orange County Register in 2011 for USA Gymnastics to change its rules, forbidding member gyms who participate in USAG events from hiring anyone on the banned list. CORRECTION: A previous version of this post had the incorrect name for the church that Peter Vidmar took over. It has been updated with the correct name.